snowdeal.org > ex machina: the eric update - day 1693: the ethics of a zoo. the eric update - day 1693: the ethics of a zoo. we had the occasion to visit the henry vilas zoo in madison, wisconsin which seems like a perfectly fine zoo, all the moreso because it's absolutely free. odin enjoyed his visit and got to see lots of animals that he's only read about in books such as this giraffe and a polar bear and chimpanzees and lions, oh my! but whenever i go to a zoo, i can't help but wonder if they're really necessary in this modern age. is anything really gained by seeing animals you wouldn't normally see confined in small spaces? and what exactly are we teaching odin? While the confinement aspects of zoos are questionable for sure, don't forget the breeding programs that many of them run. Programs like that have brought many species back from near extinction to at least some active breeding population. 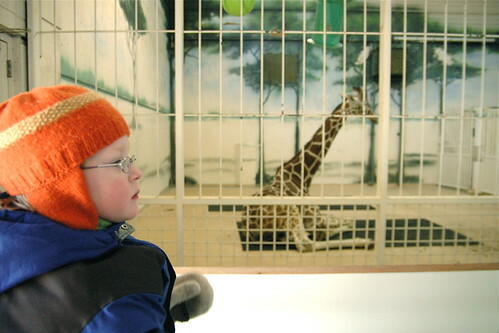 Many large zoos are often huge centers of active research, not to mention learning facilities for children and adults alike!